NEW YORK--(BUSINESS WIRE)--The Opioid Center of Support, a non-profit 501c3 organization dedicated to fighting the opioid crisis, today launched a free online resource to help the 14.2 million people in the U.S. coping with opioid misuse. Developed with leading medical experts on substance misuse and addiction, the Opioid Center of Support’s platform organizes the most trusted resources on opioid misuse in one place online, for the first time. Coinciding with National Recovery Month in September, the Opioid Center of Support is also releasing an infographic, downloadable for use here, showing how the opioid epidemic touches more than 213 million people in the U.S. (66 percent). Continuously updated resources are then organized by each stage from prevention through recovery. Similar to a Pinterest board, users may also upload their own resources to personally customize the site. The platform also contains a data donation function, which asks individuals and caregivers to donate their digital life data for scientific use in order to help model earlier identification and intervention tactics for opioid misuse. As part of the non-profit mission of the Opioid Center of Support, the team intends to expand the platform to offer greater personalization for visitors based on age, gender, comorbid conditions and other factors. Vera Bullock founded The Opioid Center of Support to develop solutions to the opioid crisis for caregivers. After her son Justin Solak died from an opioid overdose at the age of 25, Vera set out with a mission to help others suffering with a loved one coping with misuse. Having personally experienced the frustration of trying to find credible resources to help an addict on the Internet, Vera began working to build a single resource that would offer unbiased information, support and direction through all stages of opioid addiction and recovery. 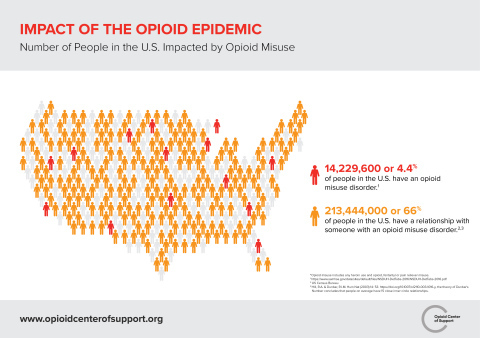 The Opioid Center of Support’s infographic illustrates how 4.4 percent of the U.S. population (14,229,600) had an opioid misuse or heroin use disorder in 2016, according to SAMHSA’s National Survey on Drug use and Health. By applying the theory of Dunbar’s number, which states that humans on average have 15 inner circle relationships, The Opioid Center of Support estimates that 213,444,000 people, or 66 percent of people in the United States, had a relationship with someone currently suffering from an opioid or heroin use disorder in 2016. The Opioid Center of Support announces free online support center for caregivers fighting the largest drug epidemic in U.S. history.